A lot of what wins first book awards from academic presses makes me barfy. Not because these are bad books but because the poems reek of safety and caution in form and or content. It is a let down, reading these books; it is a let down because I have read these books before and the book selecting algorithms seem to be stuck on repeat, as if the process of selecting these books is attended to by its administrators with the same energy a mid-level government cog revises a contract proposal or a librarian rebinds an automotive repair manual. But this is not an essay on all of that. This post is to report (overdue) a variation. 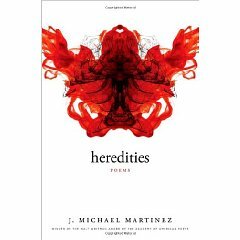 Juan Felipe Herrera chose J. Michael Martinez’ Heredities as the 2009 Walt Whitman award winner and Heredities, published in 2010, is brilliant in the ways that count. 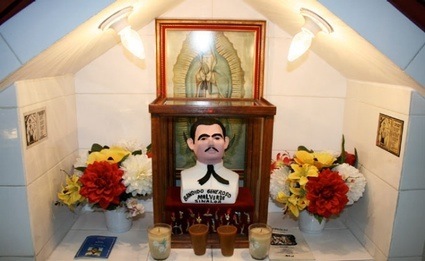 Narco shrines and the narco saints they enshrine are compelling because they represent a radical repurposing of a metaphysics and the beginnings of the repurposing of physical space in accordance with that metaphysics. They represent insurgent, topsy-turvy values–liberties taken with received truths and traditions. In some ways Heredities is a narco shrine in the often banal landscape of the college press poetries, turning a classic kind of image making and familiar avant gestures into a vehicle by which to announce a revised order. It rejects the carefulness of the lyric-narrative with the baroqueness of its image making; it drags into the the atrium of high American poetry the spine of Quetzalcoatl and the sternum of Our Lady of Guadalupe; it demands the canon both make more room for Chicano poets and poetics while also expanding the boundaries of what Chicano poetics can be (within the context in which it was published); and, finally, it asks us to take to a more complex approach in regard to speaking of origins, identity, and personhood (this post is failing in this regard). But most significant in my reading is Martinez’ rearticulation of Our Lady of Guadalupe. Saints are important. They are sites of contestation between hegemonic powers and those peoples subject to this hegemony. In their bodies hegemony is asserted or refuted; in their changing skin pigmentation, clothing, pronunciation, in their rotting or miraculously preserved bodies they reflect complex, multi-stranded cultural exchange. A saint can be the initially node through which a metaphysics is received ; it is through the saint, situated as saints are, on the borders of orthodoxy, that a metaphysics can be subtly reconfigured, made to work for those upon which the saint was imposed. onto a mirror of saphire. of a woman before being eaten. And she said: Does darkness list our erasures and become beautiful? And she said: Those I love, I translate into advent and wild foxgrape, the blind staggers of water. And then she said: The dead will return, narrow gates unlatched. To which she replied: His body is air written between my hands. Or am I romanticizing and so othering the narco-shrine and this book? Yes. Does this post ignore the work of Chicano poets Martinez is drawing from or who have already broached similar territory . Yup, that too. It was to get you to read this far. See a full on review by Laurie Ann Guerrero here.